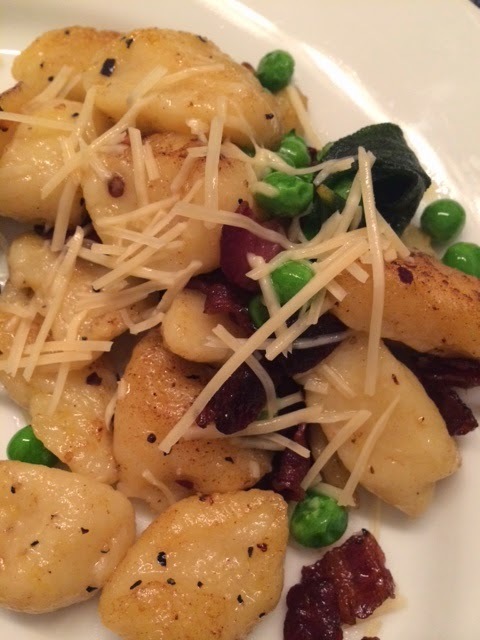 I found this "foolproof" ricotta gnocchi recipe from Masterchef winner Courtney Lapresi in Us Weekly of all places. Foolproof? Not exactly, but it was quite good and one that we will use (and base our own recipes off of) in the future. In a large bowl, combine flour, ricotta, Parmesan, eggs and salt, using a spoon, until just incorporated into a soft dough. On a well-floured work surface, shape dough into two ropes, 1-inch in diameter and 18 inches long. Using the back of a floured butter knife, cut the rope into 1-inch pieces. Indent each gnocchi using the tip of your index finger. The recipe above is not the recipe that was in Us Weekly -- for some reason, I can't find the recipe that I tore out of the magazine! The modified recipe above is from Self Magazine which calls for part skim ricotta and doesn't include pancetta. The dough was extremely sticky and not "formable" so we added almost a cup more of the flour. Cooked 3 oz pancetta with the butter. We couldn't taste the sage (and we added 8 leaves) -- needs more sage!